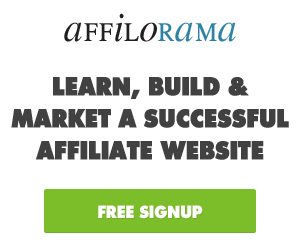 Is Affilorama the best affiliate marketing training program?? Or is it a Scam?? Read my Affilorama Honest Review to find out. Price- Basic Membership is Free. Affilorama is an Affiliate marketing training program developed by Mark Ling. Mark Ling is a renowned name in the Affiliate marketing field and he is quite popular for his Jamorama program. The best part is that the initial membership is free and you get access to quite a few brilliant training modules without paying a single penny. It is one of the best affiliate marketing training programs available in the market. Over 100 free lessons covering every aspect of affiliate marketing. From choosing niche’s to developing of websites to bringing in traffic. Nearly everything is covered. Access to Affilorama forums to keep in touch with the members and get help when required. Regular Webinars covering different fields of affiliate marketing. Great for beginner or intermediate affiliate marketers. Affiliate tools which is a set of tools essential for every affiliate marketer is free to use. The owner is a respected name in affiliate marketing, who has been there and done it. So what he teaches makes a lot of sense. The paid products are costly. Most of the Webinars focus less on skills and more on up-sells. A few concepts are old fashioned hence can’t be used today. Developed by Mark Ling, Affilorama is one of the best affiliate marketing training program available in the market. In fact it is my 2nd best recommendation for training. (My best Affiliate marketing training program review can be read here). More than 100 training videos which will teach you all the basics of affiliate marketing. Separate modules are there for Introduction to Affiliate Marketing, choosing your Niche, building your website, driving traffic and many more. Each module has different training videos which will clear your concepts and help you become more confident on that topic. The below picture shows you the different videos for the Introduction to affiliate marketing module. These videos are great for any beginner internet marketer and is helpful for intermediate marketers too. You also have access to affiliate programs to start your own affiliate business, with separate products to promote. You also have access to Affilo tools which helps you in tracking your website performance and planning different campaigns and you get this for free. In the flip side, if you plan to purchase the advanced products then the cost becomes a barrier. I have reviewed them separately in this website itself. You can read about AffiloBluprint here. Overall, Affilorama is truly one of the best affiliate marketing training program. It is my 2nd best recommendation and the best part is that it is free to join. You can join here for free. You can also join my free 7 day course which will teach you the basics of affiliate marketing and it is absolutely free. Visit my Getting Started page and join the course for free. Also, do comment on how you liked my post and let me know if you would like to know anything more. You can also mail me at sirshendu@onlinescamkiller.com and give your feedback.